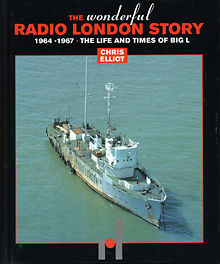 This fabulous hard back book is regarded as the authority on Radio London and tells the full story of ‘Big L’. Researched from original documents and first hand interviews, we discover how Radio London set about building one of the largest audiences in commercial radio history. Operated from a tax haven, the station would generate big profits too! ‘Big L’ soon established itself as the market leader. In its 2 years and 9 months,‘Big L’ would assist many groups of the day; The Beatles, Rolling Stones, Small Faces, The Who, The Kinks, Jimi Hendrix, Tom Jones, Procol Harum and many more would owe part of their success to Radio London, not too mention many of the DJs who would became star names - Kenny Everett, Pete Brady, John Peel, Ed Stewart and Tony Blackburn. This book captures an important part of our social history during the 1960s. 296 pages with over 100 colour and black & white photos.